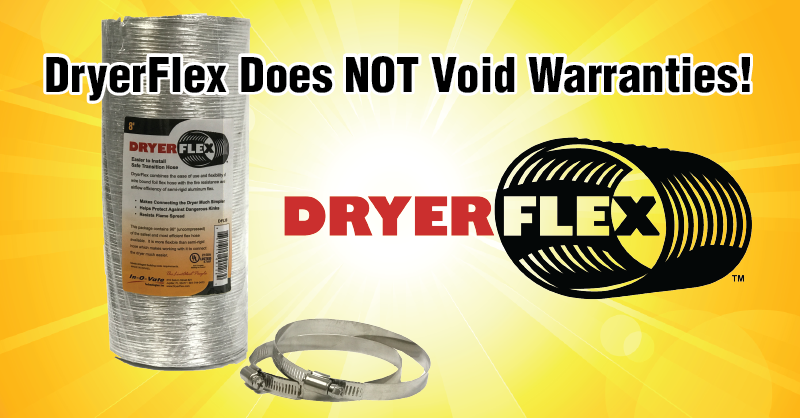 Replacing your dryer's dangerous exhaust hose with DryerFlex not only provides peace of mind as far as safety goes, but it is also compliant with the manufacturer's warranty requirements. Most dryer manufacturers specify what type of dryer exhaust hose must be used with their product in order to avoid voiding the warranty. DryerFlex meets these conditions. When white vinyl or "slinky" foil is used, the appliance warranty may be voided due to the vulnerability of using these dangerous transition materials. Dryerflex is not considered "slinky foil" and is made of 5 layers of all-aluminum ribbon and is UL 2158A listed. As an example, Samsung dryers' Q & A site states that, "An exhaust system made of rigid metal or flexible stiff-walled metal exhaust ducting" must be used. It also states, "Use only those foil-type flexible ducts, if any, specifically identified for use with the appliance by the manufacturer and that comply with the Outline for Clothes Dryer Transition Duct. Use Subject 2158A." DryerFlex falls into both of these categories. So, rest easy by replacing your exhaust hose with DryerFlex today!